These images show evidence for the possible detection of a binary star system that was later destroyed in a supernova explosion. 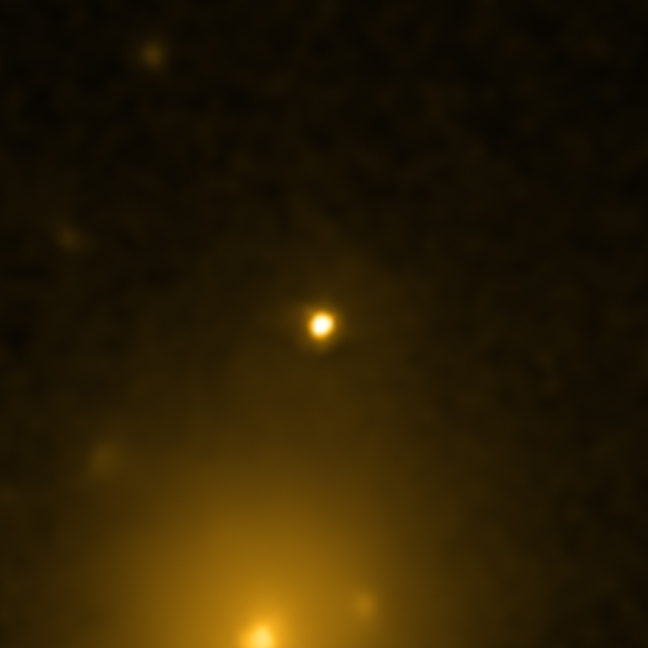 The right panel shows a SWIFT image, obtained with the optical/UV monitor, of the elliptical galaxy NGC 1404. At the center of the image is the supernova SN 2007on, originally discovered by the 0.25-m robotic telescope TAROT at La Silla in November, 2007. The left panel shows a Chandra X-ray Observatory image of the same field taken 4 years before the supernova was detected. The position of SN 2007on in the Chandra image is shown with a white circle, plotted with a radius that is much larger than the uncertainty in the supernova's position. 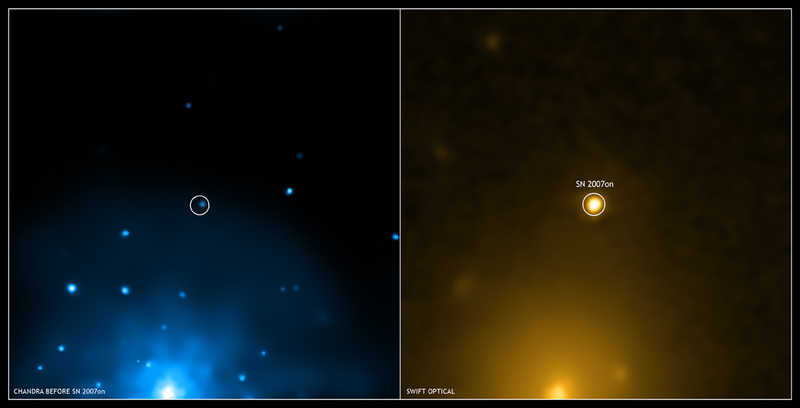 The initial search for the progenitor of SN 2007on, reported in Nature, argued that the X-ray source lying inside the circle is the likely progenitor for the supernova. This claim was based on two main pieces of evidence: (1) the chance of a source being so close by coincidence is small, and (2) the X-ray source has similar properties to those expected for a particular type of progenitor predicted by theoretical work. However, this study included a relatively large uncertainty in the position of the supernova. Follow-up studies, yet to be published, used higher-quality optical images to better determine the supernova's position. This work showed there is a small, but significant difference in the measured positions of the supernova and the X-ray source, suggesting the source may not be the progenitor. This difference is visible in the left panel as the offset between the X-ray source and the center of the white circle. SN 2007on was a Type Ia supernova, an important class of object used to measure the expansion of the Universe. They are generally agreed to be produced by the explosion of a white dwarf star in a binary star system. The progenitor to a Type Ia supernova has never been detected, but promises to answer important questions about the exact configuration and trigger for these explosions. Is the explosion caused by a collision between two white dwarfs, or because a white dwarf became unstable by pulling too much material off a companion star? If the latter possibility is correct, fusion of material on the surface of the star should heat it and produce a strong source of X-rays before the explosion. Once the supernova explosion occurs, the white dwarf is expected to be completely destroyed and then would be undetectable in X-rays. Scale Each panel is 2.4 arcmin across. Coordinates (J2000) RA 03h 38m 50.9s | Dec +35° 34´ 30"